The Washington Nationals have signed Max Scherzer to a seven year deal worth more than $180 million reports Ken Rosenthal of Fox Sports. 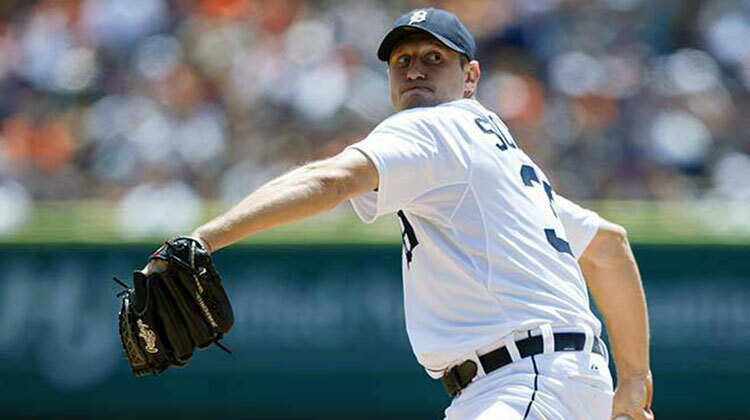 Scherzer lingered on the free agent market long after other top free agents had signed. However, waiting out the market paid off for the Scott Boras client. His deal topped those signed by C.C. Sabathia and the extensions for Justin Verlander and Felix Hernandez. The 30 year-old Scherzer has been one of the top pitchers in baseball over the last three seasons. He took home the CY Young award in 2013 after winning 21 games and authoring a 2.90 ERA with a strikeout rate of 28.7 percent. In the offseason the Detroit Tigers offered him a six year contract extension worth $144 million which he turned down. Scherzer followed up his 2013 season with an excellent 2014 campaign. His ERA rose slightly to 3.15, but his strikeout and walk rates remained substantially the same. While Scherzer’s unconventional delivery looks like it might put him at a higher risk of injury, he’s been remarkably healthy over the course of his career. He’s made at least 30 starts in every season since 2009, his first full year in the big leagues. Pitcher health is unpredictable, but past health is the best indicator of future health. His deal with the Nats puts him under contract through his age-36 season. By that point, his contract will likely be a liability, but for now the Nats have another ace-quality pitcher in their rotation. Steamer projects a 3.01 ERA and +4 fWAR for Scherzer in 2015. By signing Scherzer, the Nationals have strengthened a rotation that was already one of the best in the major leagues. Prior to signing Scherzer, their rotation included Stephen Strasburg, Jordan Zimmermann, Gio Gonzalez, Doug Fister and Tanner Roark. As things stand, Roark, who posted a 2.85 ERA and +3 fWAR in 2014. With this surplus of starting pitching, the Nationals might look to deal one of their arms. Zimmermann is entering the last year of his contract, and it appears unlikely that the Nationals would be able to sign him to an extension. Fister is in the same position, and Strasburg has just two years remaining. Dealing any of these players could give the Nationals some long-term control allowing them to reload for 2016 and beyond. Or, they could stand pat and enter the 2015 season with Gonzalez as the No. 5 starter. Whatever the case, the Nationals and Max Scherzer and in an enviable position. They were clear favorites in the NL East before the signing and one of the top teams in baseball. Scherzer didn’t come cheap, but he certainly bolsters the Nats World Series hopes.